Excessive drinking is defined by the CDC as consuming 5 or more drinks for men and 4 or more drinks for women in a single occasion. 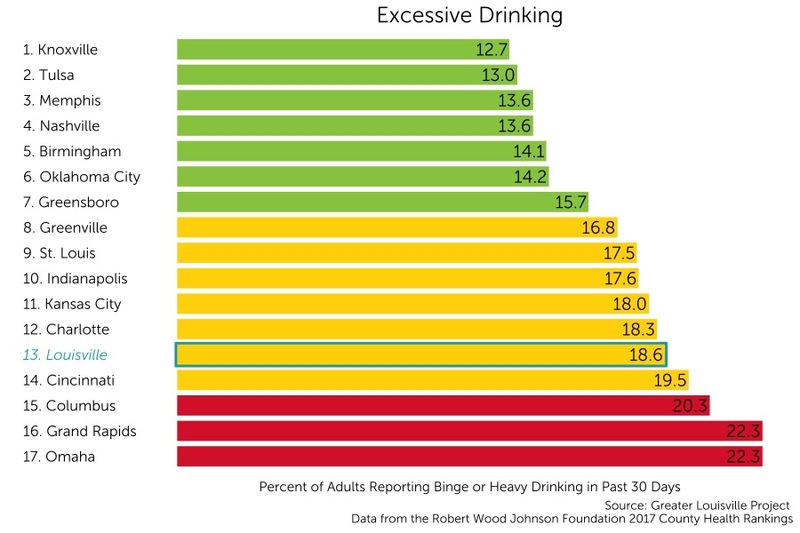 Binge drinking is a serious health issue leading to a variety of detrimental health outcomes and is the fourth leading cause of death in the United States. Long-term, excessive drinking can lead to chronic health issues such as liver disease, pancreatitis, and even brain damage. Louisville currently ranks 13th among its peer cities in percentage of people reporting excessive drinking incidents with 18.6% of adults reporting excessive drinking in the past 30 days.